The Augusta National Golf Club Welcomes You To The Masters. This query was offered on a program I listened to yesterday morning. Actually, it was more of like an observation posing as a question, at least it sounded that way to me. 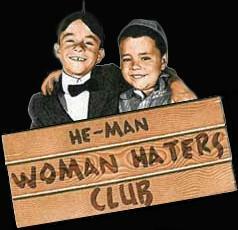 It’s an annual national argument, the Augusta National Golf Club, home of the PGA’s Masters Tournament doesn’t admit women, no girls allowed, they’re sorta like the Little Rascals He-Man Woman Haters Club I guess. This being a election year the annual argument is attracting even more attention than usual. I think excluding women is dumb but Augusta National is a private club, its their choice and through the years, despite enormous pressure from a variety of sources, they’ve made their position quite clear; they’ll change their policy and admit women when they’re damn good and ready and not one minute before. When I heard that I couldn’t help but wonder how many times that argument was used by segregationist not too long ago. Were he black, or a woman, I suspect my local talk radio host would know the answer to that question. He’d also understand why so many find segregation, for race, gender or sexual orientation so offensive. I agree with your point, but… OTOH, there is a bit of truth to the reporter’s question. I recall years back when some northern church had a big debate on whether to allow blacks to join them. The ‘integration’ side finally won the fight, only to realize what the war had had cost them when no blacks whatsoever came by to take them up on the offer.